To answer/end/reject/redial a call by the bluetooth speakerphone. Bluetooth Specification: V4.1. 1 x Bluetooth Handsfree Speakerphone. 1 x USB cable. Due to the light and screen setting difference, the item's color may be slightly different from the pictures. 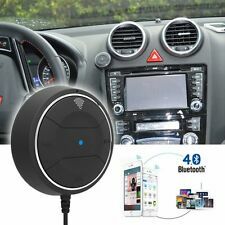 Wireless Bluetooth 4.0 Music Receiver 3.5mm Adapter Handsfree Car AUX Speaker. Supports all compatible Bluetooth enabled device. Built-in microphone. •Bluetooth frequency: 2402 MHZ ~ 2480 MHZ. •Bluetooth profiles supported: HFP, HSP, A2DP and AVRCP. Item type: Car Handsfree Speakerphone. 1 BT Handsfree Speakerphone. With an advanced built-in microphone, a DSP solution with echo cancellation and noise suppression. The speaker provides an excellent sound quality for you. Can make/answer/end/reject/redial a call by the Bluetooth speakerphone. 1 x Bluetooth Hands free Speakerphone. Built in speaker and microphone. 1 x USB cable. We will reply you ASAP. Can make/answer/end/reject/redial a call by the Bluetooth speakerphone. 1 x User Manual. 1 x USB cable. Color: Black. Multipoint Speakerphone. Allows a speakerphone. Compatible bluetooth specification V4.0. 1 x Bluetooth Kit. Full duplex & high performance speaker. Support secure simple pairing. Do not run through your life so fast that you forget not only where you have been, but also where you are. This Bluetooth music receiver (handsfree) is a high-tech that can receive a cell phone or wireless Bluetooth music transmitter on. This music receiver is used in almost all of the audio receiver which can be used with input plug, including automotive devices. Multipoint Speakerphone. Allows a speakerphone. Compatible bluetooth specification V4.0. 1 x Bluetooth Kit. Full duplex & high performance speaker. Also note that monitor settings may vary from computer to computer and may distort actual colors. Can make/answer/end/reject/redial a call by the Bluetooth speakerphone. 1 x Bluetooth Hands free Speakerphone. Built in speaker and microphone. Bluetooth Specification4.1. We will reply you ASAP. 1 x User Manual. Consente un vivavoce. Altoparlante full duplex e ad alte prestazioni. Specifiche bluetooth compatibili. 1 kit Bluetooth x. 1 caricatore per auto. 1 manuale utente x. 1 x Cavo di ricarica USB. Sono sicuro che sia la cosa giusta di cui hai bisogno ora. Écouteurs, qualité A , commande de lecture et micro HD intégré. qualité sonore professionnelle avec ces écouteurs. Longueur : 1,2 m. Couleur : Blanc. Que demandez de plus?. Wireless allant jusqu'à 10 mètres. de réponse / fin / rejeter / recomposer un appel par le bluetooth haut - parleur. v4.1 bluetooth spécification Nous ne travaillons pas à Hong Kong. 1 x support en fer. Easy installation, Compatible with bluetooth-enabled phones, Quick clip-on for sun visor. This portable mini-designed bluetooth speakerphone is specially designed to give you convenience and freedom of wireless communication. 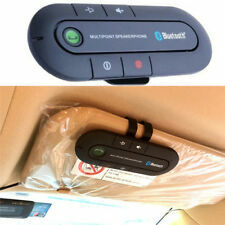 Bluetooth Wireless in Car Multipoint Speaker Phone Visor Clip Hands free Car kit. Equipped with high fidelity 2W loudspeaker, and high sensitivity microphone. Bluetooth version:V4.0 EDR 2. Support A2DP. Will be installed to install the buckle installed in the original door handle position. Le 05-mars-18 à 22:14:04 Paris, le vendeur a ajouté les informations suivantes Remove the handle from the buckle. Costruito in vivavoce e microfono. v4.1 bluetooth specifica La qualità è garantita! Spediamo articoli in tutto il mondo. 1 x ferro titolare. 1 x manuale utente. 1 x cavo usb. Modèle : lot de 2 kits mains-libres universels - enceintes Bluetooth®. Portée de réception Bluetooth® : 9 m. Clip magnétique amovible. Autonomie : jusqu'à 5 heures d'écoute en continue. Boutons des fonctions . 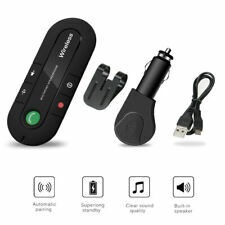 Wireless Bluetooth 4.0 Music Receiver 3.5mm Adapter Handsfree Car AUX Speaker. This Handsfree Car Kit Requires a 3.5 mm Input Jack in Your Car Stereo System. Supports all compatible Bluetooth enabled device. Este es un micrófono externo opcional para unidades principales de radio de coche con funciones integradas. Módulo de interfaz bluetooth externo. Instale el micrófono en una posición y orientación que le permita captar la voz de la persona que opera el sistema. Usalo collegare il jack cuffie da 3,5 mm per rendere il vostro auricolare diventare cuffie wireless Bluetooth. - Basta un secondo per rendere i diffusori diventano altoparlante bluetooth. - Versione di Bluetooth: V4.1. Description: BT4823 Bluetooth 4.1 3.5mm AUX Audio Stereo Music Home Car Receiver Adapter with transmission range up to 30ft,Support Bluetooth mode : HFP/HSP/A2DP/AVRCP, widely compatible with most mobile phones: iPhone, Android phone such as Sansung, HTC, Sony, and More Smartphone. Two bluetooth devices supported at the same time, business call and personal use available. Wireless technology, enjoy stereo music/call answering with safe driving guaranteed! . Car Wireless Bluetooth 3.0 Audio Receiver Dongle Music Adapter Built-in Mic Aux 3.5mm. This product can be used with pretty much any audio receiver with an audio input jack which includes cars. 1x Car Bluetooth Adapter. 3.5MM AUX Cable: 150cm. Bluetooth Version: 4.0. Bluetooth Frequency: 2402 MHZ ～ 2480 MHZ. Bluetooth Profiles supported: HFP, HSP, A2DP and AVRCP. Bluetooth Rang: up to 30 feet. 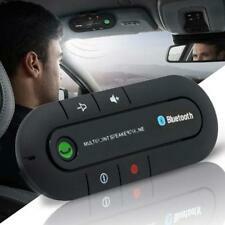 1 X Bluetooth Car Kit. This Car Kit Requires a 3.5 mm Input Jack in Your Car Stereo System. Full auto pairing, this car kit will automatically pair with the latest Bluetooth 2.1 enabled handsets. Auto connect function. Compact, sleek contemporary design. Portable and stylish design makes it great choice for you in daily life. - High-quality audio: Bluetooth V4.2 EDR, designed for great sound with HD Voice, noise cancellation technology and stereo speaker. Type: Car Bluetooth Speakerphone. 1 x Bluetooth Speakerphone. Bluetooth 4.0 design, easy to connect. Bluetooth Version: V4.0. Battery: 800mAh Lithium Battery(Built-in). There is a magnet on the back, easy to use just one hand to install on or take off the speakerphone from any cars' sunvisor in 3 seconds! Support dual phone connection. This Speakerphone will turn to be dormant automatically after 10 minutes when it is no connection.